We’d love your help. Let us know what’s wrong with this preview of Jackpot by Gordon Korman. 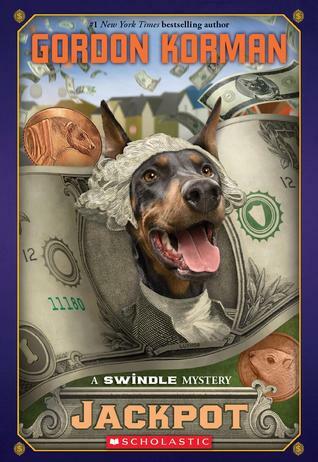 The sixth installment in the Swindle series, in which The Man With The Plan gets a new rival . . . and the search for a missing lottery ticket becomes a hunt of epic proportions. JACKPOT: the top prize in a game or lottery; a sensational and unexpected success, stroke of luck, windfall, bounty, pay day . . .
What would you do with $30,000,000? That's the question everyone in The sixth installment in the Swindle series, in which The Man With The Plan gets a new rival . . . and the search for a missing lottery ticket becomes a hunt of epic proportions. What would you do with $30,000,000? That's the question everyone in Cedarville and every town near it is asking, because right now there's an unclaimed lottery ticket worth that much -- and the money will go to whomever finds it first. Griffin Bing, The Man With The Plan, wants to be the lucky winner. But he's got competition. Darren Vader, Griffin's number-one enemy, will stop at nothing to find it. And a new kid in town, Victor Phoenix, is also in on the big hunt. He's got an advantage that Griffin would have never guessed: Griffin's own friends are helping Victor out. But why? To ask other readers questions about Jackpot, please sign up. The Man with a Plan is out on another adventure. Griffin Bing and his team are out to find a lottery ticket worth 30 million dollars until 6:00 on October 6th, when the the ticket will be worthless. But this task isn't as easy as any of the other missions Griffin has attempted. His rival, Darren Vader, will stop at nothing to find that ticket. A new kid, Victor Phoenix, is also searching for it, and he has an advantage that Griffin wouldn't have guessed. This is an action-packed novel for anybody The Man with a Plan is out on another adventure. Griffin Bing and his team are out to find a lottery ticket worth 30 million dollars until 6:00 on October 6th, when the the ticket will be worthless. But this task isn't as easy as any of the other missions Griffin has attempted. His rival, Darren Vader, will stop at nothing to find that ticket. A new kid, Victor Phoenix, is also searching for it, and he has an advantage that Griffin wouldn't have guessed. Griffin is back, still bedeviled by Darren Vader, and still hanging in there with his group of friends. However, there is a new kid in town, Victor Phoenix, who seems to hate Griffin and be intent on stealing all of Griffin's friends. When Griffin finds out that Victor was the target of bullying at his old school, he hopes to dissuade his friends from hanging around with the kid, but the plan backfires. When the news hits the town that a $30 million lottery ticket was sold nearby and needs to be Griffin is back, still bedeviled by Darren Vader, and still hanging in there with his group of friends. However, there is a new kid in town, Victor Phoenix, who seems to hate Griffin and be intent on stealing all of Griffin's friends. When Griffin finds out that Victor was the target of bullying at his old school, he hopes to dissuade his friends from hanging around with the kid, but the plan backfires. When the news hits the town that a $30 million lottery ticket was sold nearby and needs to be claimed very soon before it expires, Griffin is bound and determined to find out where the ticket is. He starts by trying to fool Darren into thinking that it's in the garbage somewhere, but that plan backfires. Soon, he finds himself working with Darren (albeit briefly) and interviewing the former hippie owner of the convenience store, Mike. After a lot of running about and adventures, Griffin, Darren, and the rest of the gang figure out where the ticket is. The unorganized Mr. Fielder has been using it as a book mark in one of his many grievously overdue library books... which he has just returned to that Green Hollow Public Library. Can the group locate the ticket before the deadline is up? Strengths: These books all have a fun, varied ensemble class, and first rate highjinks. Seeing Griffin working with Darren was kind of fun. This is Gordon Korman-- how can you do wrong? This has to be my favorite book in the whole Swindle series. Loved it. A deadline is approaching, one that could leave one person in the world $30 million dollars richer... or not. Our favorite group of kid schemers are back... and they're going after a missing lottery ticket that hasn't turned up in almost a year's time; if the winner doesn't collect soon, there's no money. Griffin Bing and his friends get involved, except, this time, they're not working on the plan together. EVERYTHING we thoug This has to be my favorite book in the whole Swindle series. Loved it. * Griffin isn't the ringleader of the team's new scheme. * There's a new Man With The Plan taking over. * Griffin's reputation is going to the pits... he's now a bully?! * Plus, he's "associating" with Darren Vader, the previously sworn enemy. * And to top it off, Luthor isn't even as vicious as he always did seem... (he's more of a "sweetie", just like Savannah always said). I am a huge Gordon Korman fan. This was not my favorite book of his. There were so many things that happened that almost had me rolling my eyes because they were soooo unlikely. I kept thinking, "Seriously, what are the odds that...."
I did enjoy the book, however I did not find it to be as action driven as his other books I have read. Some people have said that they like that it is more character driven, yet I don't see that I found myself attaching to the characters. And the way the book ended. I am a huge Gordon Korman fan. This was not my favorite book of his. There were so many things that happened that almost had me rolling my eyes because they were soooo unlikely. I kept thinking, "Seriously, what are the odds that...."
I did enjoy the book, however I did not find it to be as action driven as his other books I have read. Some people have said that they like that it is more character driven, yet I don't see that I found myself attaching to the characters. And the way the book ended... I think Bing was waaay too forgiving and that didn't even make sense that he was able to just let it go after everything he went through. Takes more than being clever and sneaky to be a good friend. The book that I decided to read as my book 8 was "Jackpot" by Gordon Korman. This story is about a young boy, Griffin Bing aka "The Man With a Plan", who has yet another crazy and adventurous plan. A 30 million dollar lottery ticket has gone missing but that is not the biggest problem for Griffin. There is a new kid in town and he is "stealing" all of Griffin's friend which is also his team for putting plans into action. Griffin has to go around 3 towns in Long Island searching for a lottery ti The book that I decided to read as my book 8 was "Jackpot" by Gordon Korman. This story is about a young boy, Griffin Bing aka "The Man With a Plan", who has yet another crazy and adventurous plan. A 30 million dollar lottery ticket has gone missing but that is not the biggest problem for Griffin. There is a new kid in town and he is "stealing" all of Griffin's friend which is also his team for putting plans into action. Griffin has to go around 3 towns in Long Island searching for a lottery ticket on his lonesome. Meanwhile, the "team" is also searching for the ticket without Griffin, with the new kid Victor, and even Griffin's arch nemesis Darren! Throughout this action packed adventure, the 2 groups search for the ticket while learning new things about themselves and others. I rated this book as a three for a couple different reasons. I did like this book a lot but I did not think that it was as good as some of Gordon Korman's other writing. This story had a decent plot but I felt that it was a little slow. If i could change anything about the book, it would be for it to have a longer climax and a shorter exposition. Although "Jackpot" was not my favorite book, I still enjoyed it and I think many other people would enjoy it too. I would recommend this story to younger readers because it was not very challenging. "Jackpot" also had a lot of good content and it was one great adventure that I hope many people will have the chance to read! In this book a group of friends is investing a lottery ticket worth millions that won a while ago but it never was cashed in. About a week before the ticket expires they decided that they wanted to find it and try to cash in some of the money. They investigate people who have been known to buy lottery tickets at the store that it was purchased from and they search a few that have been know to be hoarders or people that lose things. This book is a great read. It grabs your attention page after pa In this book a group of friends is investing a lottery ticket worth millions that won a while ago but it never was cashed in. About a week before the ticket expires they decided that they wanted to find it and try to cash in some of the money. They investigate people who have been known to buy lottery tickets at the store that it was purchased from and they search a few that have been know to be hoarders or people that lose things. I really liked this book it was about the 6 kids trying to find a missing lottery ticket for 33 million dollars. They check the security cameras at the store the ticket was bought from and wrote down suspects. They go around town searching for the people who could of been the owner of the ticket. read the book to find out if they find it. This book I really enjoyed reading this book. This book kept me reading just so I can figure out what happens at the end. The book was suspenseful throughout the whole entire book. After I finished reading this book I felt this is one of the better book that I read . At the end this book was great all around. I normally do not enjoy fictional books but this book I enjoyed even if it is fictional. Overall the whole hunt for the 30,000,000 dollars was fun to see the characters go through all of this. I would like to read more books by Korman because of the way he writes his books. 3.5 stars. My least favorite so far of this series....though I am reading them out of order. I think it is very kind of the kids to give the grand prize to Mr. Fielder. And it is unusual when you run into someone who donates 3 million bucks for the library. Jackpot, by Gordon Korman, is a standard mystery book that I didn’t really enjoy. It did teach a powerful moral that people shouldn’t fight against others to get what they want. I thought that the best parts of the book were when different people were doing different things, yet Gordon Korman made it all seem flow logically. There was never a confusing part in this book at all. Something that I didn’t like was the fact that the conclusion to the book came just a few pages after the climax and I Jackpot, by Gordon Korman, is a standard mystery book that I didn’t really enjoy. It did teach a powerful moral that people shouldn’t fight against others to get what they want. I thought that the best parts of the book were when different people were doing different things, yet Gordon Korman made it all seem flow logically. There was never a confusing part in this book at all. Something that I didn’t like was the fact that the conclusion to the book came just a few pages after the climax and I would have liked more unwinding by Korman. In the end, this was a standard mystery book which I wouldn’t read unless there was nothing else to read. It was fine, but a little unsatisfying. It was very good I liked the details it had! I thought Jackpot was a pretty good book. It made you keep guessing what was going to happen next, so I wanted to keep reading on and on. The plot was very good, and I also really liked the author, Gordon Korman. I thought ¨Jackpot¨ was a pretty good book. It made you keep guessing what was going to happen next, so I wanted to keep reading on and on. The plot was very good, and I also really liked the author, Gordon Korman. Griffin Bing has many friends. They all work together to solve mysteries. One day Griffin thinks of a plan. He sends Darren Vader, his arch nemesis, on a trip all through town to find the missing thirty million dollar lottery ticket. It´s all a trick, though, and Darren finds out; he calls Griffin a bully in front of the whole school. Griffin´s world gets turned upside down. He loses his friends ,which side with Victor Phoenix. At the end they find the missing lottery ticket and cash it in. One of the shortest Swindle novels, and one of the biggest stories. This was really great! I finished this in a day- I couldn't stop reading! Gordon Korman really is one of those true masters with words, and I didn't see any of those twists coming! Wait...is saying there's a lot of twists spoiling? If so, I'm so sorry. Griffin Bing or the man with the plan found his friends hanging out with the new kid, Victor Phoenix! Griffin has come up with a plan to find the $30 million lottery ticket and to win back his friends, but yesterday partner up with the worlds biggest bully, Daren Vader! Well griffin find the lottery ticket and will he win back his friends? Find out when you read Jackpot. There's 30 Million dollars on the loose. Someone won the Giga Millions Lottery on October 6th, however, no one knows where the ticket is or who won. There's 3 weeks until it is worth zero, a year after it was purchased. Griffen and his group of friends want to get back at Darren, the school bully. However, Darren manages to make Griffen look like a bully in front of the whole school and the new kid. Victor Phoenix joined his group of friends and has kind of replaced Griffen while unsuspectedly turned the group's back on him. He finds out Victor was bullied severely at his old school and changed his last name to Phoenix from Feeney. Now he's planning to find the lottery ticket partnering with Darren to prove he's the real Man With The Plan. However, to secure his position in the group, Victor has planned on doing the same thing since Darren gave him the idea. Victor and the group finally narrow it down to one person: Mr. Fielder (he's a hoarder). They know he uses whatever paper is lying around as bookmarks, so it must be in one of his books. On a long journey with unexpected twists and turns, they finally find the ticket and turn it in with an astonishing 2 SECONDS LEFT! Everyone is friends again and most of the money goes to the local library along with a bit to each family who helped out. There is 30,000,000 dollars up for grab on a lost lottery ticket and it is somewhere in Cedarville. Griffin Bing wants to win the money, but his enemy ,Darren Vader, wants the money for himself. A new kid that started going to their school, Victor Phoenix, is in on the ticket, but his helping the wrong side which he doesn’t know he is doing. In the end Griffin finds the ticket, but the money doesn’t go to him. It goes to the man that owned the ticket, yet lost it. The old man was nice enough to give everyone that help find the ticket some money though. I don’t like this for many reasons also, but i hate this book for the same reason I like it. I mean I can believe if one of these things happen but all of them. This book is good and it might have happened, but i don’t think the way it went down actually happen. I mean wouldn’t you agree? I don’t think, so why should you? Have you ever heard of an unclaimed 30 million dollar lottery ticket? That is the plot of the book Jackpot. In it, student Griffin Bing, A.K.A. The Man With The Plan, and his friends, Ben Slovak (his best friend), Antonia "Pitch" Benson (a climber), Melissa Dukakis (a computer whiz), Savannah Drysdale (an animal lover), and Logan Kellerman Atwater Jr. (an actor), are trying to find the lottery ticket before it expires. A new kid in town named Victor Phoenix is working with Griffin's friends. He' Have you ever heard of an unclaimed 30 million dollar lottery ticket? That is the plot of the book Jackpot. In it, student Griffin Bing, A.K.A. The Man With The Plan, and his friends, Ben Slovak (his best friend), Antonia "Pitch" Benson (a climber), Melissa Dukakis (a computer whiz), Savannah Drysdale (an animal lover), and Logan Kellerman Atwater Jr. (an actor), are trying to find the lottery ticket before it expires. A new kid in town named Victor Phoenix is working with Griffin's friends. He's not working with Griffin because he erroneously thinks Griffin is a bully. Griffin is forced to work with Darren Vader - a real bully in his school - to help him find the ticket. I like this book because it has an exhilarating plot. It has all the same characters from the original book (Swindle), and they're all very are well developed. For example, Griffin is very worried because his friends abandoned him. I could feel that emotion from the writing, and I felt ticked off when Griffin's friends left him. I think the author may have written that part because he experienced something similar in his own life, and may have been using the story as an outlet for his emotion about it. The book made me think of how awful it would feel to lose my friends. Korman wrote his first book, "This Can't be Happening at Macdonald Hall", when he was 12 years old, for a coach who suddenly found himself teaching 7th grade English. He later took that episode and created a book out of it, as well, in "The Sixth Grade Nickname Game", wherein Mr. Huge was based on that 7th grade teacher. Korman moved to New York City, where he studied film and film writing. While i Korman wrote his first book, "This Can't be Happening at Macdonald Hall", when he was 12 years old, for a coach who suddenly found himself teaching 7th grade English. He later took that episode and created a book out of it, as well, in "The Sixth Grade Nickname Game", wherein Mr. Huge was based on that 7th grade teacher. Korman moved to New York City, where he studied film and film writing. While in New York, he met his future wife; live in Long Island with their three children.